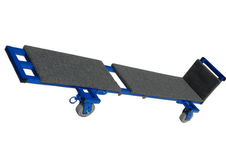 The PME line is a great choice for all serious piano movers. Get the right equipment at a super affordable price. Item: PME Skidboard 5 ft. The PME line of piano moving equipment was developed by a piano moving expert. It first started out on the day he decided to make his own piano dolly with pneumatic tires, so he could move pianos across gravel parking lots and lawns without trekking all the dirt into his clients' homes. This resulted in the 6 Wheel All Terrain Dolly. Subsequently, a vast amount of real life piano-moving experience, led to the development of an entire line of piano moving products. All equipment is hand fabricated in the USA, with only the highest quality materials. The PME company is the finest equipmet you will find for moving your pianos. We get feedback from customers who are still using them to death more than 20 years after they have purchased them!